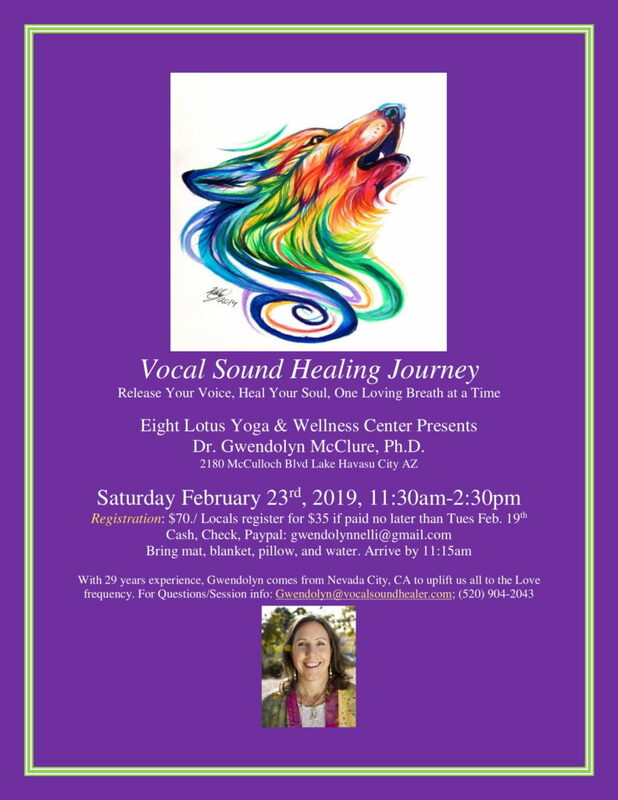 First stop on Gwendolyn’s 2-week SW tour, please join us in Lake Havasu City at Liezl’s beautiful Eight Lotus Wellness Center for this beautiful time together of love, support, clearing, and uplifting energies. Explore how to use the human voice to connect with the deeper levels of your Soul! With 29 years experience, Gwendolyn comes from Nevada City, CA to uplift everyone to the frequency of Love. Gwendolyn wrote the first doctoral dissertation in the world on this topic entitled: “A Cross-Cultural Interdisciplinary Study of the Healing Power of Singing & Vocal Sounding” (Pacifica 1998). To learn more about her work, visit: http://vocalsoundhealer.com.